Lock in a great price for Hotel 7 Pools SPA – rated 9.2 by recent guests! Excellent new hotel with polite stuff ,great spa facilities and comfortable location. Is not far from skipass station. 100% recomended. Thanks for all !!! Two-Bedroom Maisonette was extremely spacious, and fully equipped (kitchen, dishwasher, refrigerator, washing machine, oven, kettle, toaster-oven...). 2 bathrooms 1 including shower and 1 a bathtub was extremely useful. GREAT SPA!!! many pools, and Jacuzzi. Staff was great. Offered packed breakfast since we had to checkout in the middle of the night. Ski shuttle was great. We had his phone number and he came to pick us up 2 minutes after we called. Breakfast was good. Everything besides the food. Wonderful place, the rooms are big, everything is new, the spa is amazing, 7 pools (2 big ones, jacuzzi, small pools for kids). It's my favorite place!! BUT PLEASE CHANGE THE CHEF. Great rooms , very spacious and comfortable . Very nice spa area . 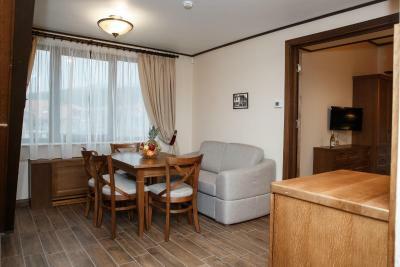 The staff is very friendly, the apartments are very warm and spacious. All the problems are solved in 10 minutes. 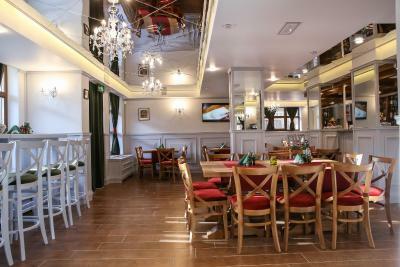 The food is great for this category of hotel, a great choice of breakfast and dinner meals. SPA is great, several swimming pools and everything is very clean. The location is 10 minutes to the gondola and 15 minutes to the center by walk. Provided transport of skiers to gondola from 08:00 to 16:30. The receptionist always smilling and helpfull,fresh and tasty food in both meals,comfortable and new apartments!! !The spa area really clean and relaxing!! !We'll be back for a longer stay!!! Hotel 7 Pools SPA This rating is a reflection of how the property compares to the industry standard when it comes to price, facilities and services available. It's based on a self-evaluation by the property. Use this rating to help choose your stay! 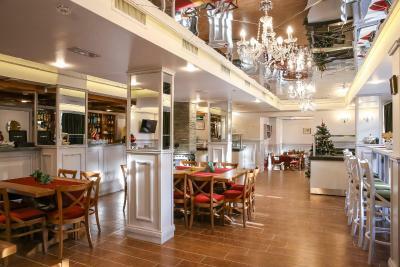 One of our top picks in Bansko.Featuring several swimming pools including a big indoor pool, a hydro-tonic pool and an indoor children pool with water slide, Hotel 7 Pools SPA is located in Bansko. 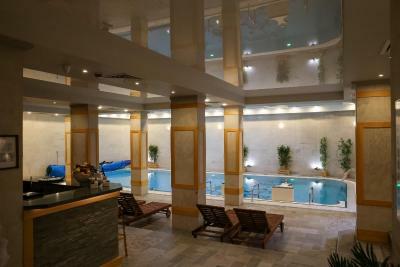 It also features a fitness center and a modern spa center with hammam, salt room, Turkish bath and 2 Finnish saunas. A 24-hour front desk is available. All rooms at the hotel are equipped with a seating area, a flat-screen TV with satellite channels and a private bathroom with free toiletries and a shower. Some rooms also feature a kitchen with a dishwasher and an oven. All units at Hotel 7 Pools SPA have air conditioning and a wardrobe. 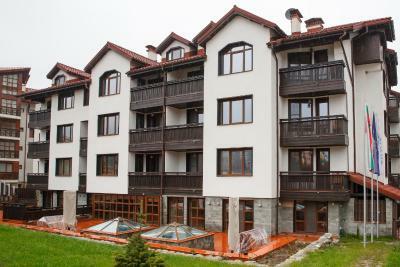 Bansko Municipality is 1.2 mi from Hotel 7 Pools SPA, while Holy Trinity Church is 1.5 mi away. When would you like to stay at Hotel 7 Pools SPA? This apartment has a balcony, oven and bathrobe. This apartment features a balcony, microwave and bathrobe. House Rules Hotel 7 Pools SPA takes special requests – add in the next step! Hotel 7 Pools SPA accepts these cards and reserves the right to temporarily hold an amount prior to arrival. Poor breakfast. The hotel is situated on the outskirts. Apartment amenities. 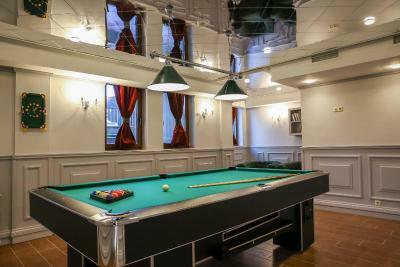 Pool and Gym. The breakfast could use more variety but it’s good. Staircase in the Maisonette was high (tiring after skiing all day) and a bit scary for little kids. It has the most unusual staircase. 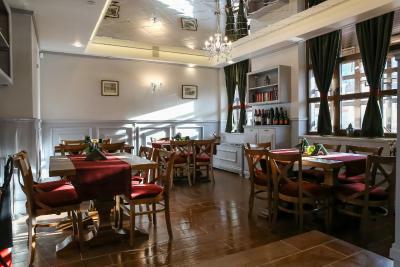 Food was horrible, the breakfast was not varied, very low-quality ingredients, fake honey, no tea, colored sausages. I starved every morning. The second time at this facility. Comfortable big room, with new appliances. A variety of spa options are available for free; massages at relatively cheap price. Everything was great. Maybe breakfast should start from 7:00 in winter because of skiing. Otherwise, they completely fulfilled our expectations. 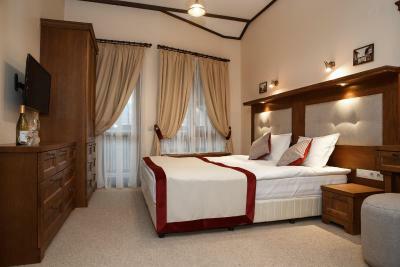 The hotel is quite new so the rooms are in good shape and the facilities as well. The pools are clean and quite large. The staff was really nice, the even took us to the gondola outside shuttle schedule (the hotel was quite free at the time). Diner was pretty good, a nice selection of food. The schedule of the bus to the ski lift wasn't planned according to ski lift schedule. The pools and spa were very nice. The meals were only so-so, we are vegetarians, but when they knew we couldn’t eat what they were serving they made us a special plate of vegetarian food. The quality can be better, but the service and the good intentions made up for it.